My family loves seafood, and this Shrimp Scampi recipe is one of their favorites! It's a really easy recipe to follow, and it tastes fantastic. The sauce is cooked with garlic, lemon, parsley, and some chili flakes to give it the extra kick. Serve up the fresh shrimps and the tasty garlic sauce with some of your favorite pasta for a wonderful and complete meal. Pour the olive oil in a large baking dish. Place in the oven for about 6 to 8 minutes or until the oil is hot. Meanwhile, in a large bowl combine the shrimps, chili flakes, garlic, lemon zest, parsley, breadcrumbs, olive oil, sea salt, pepper, and mix well. Remove the baking dish from the oven and carefully place the shrimp mixtures in the hot oil, and top with butter. Return to the oven and bake for another 5 to 6 minutes or until the prawns are just cook. If you are serving with pasta, then mix in the cooked pasta and season with lemon juice, sea salt, pepper, and top with additional parsley. Serve warm. Yum! This looks delicious. I've never cooked shrimps or prawn in the oven before. oh wow this looks really simple and yummy! i like the first picture - looks very fresh! 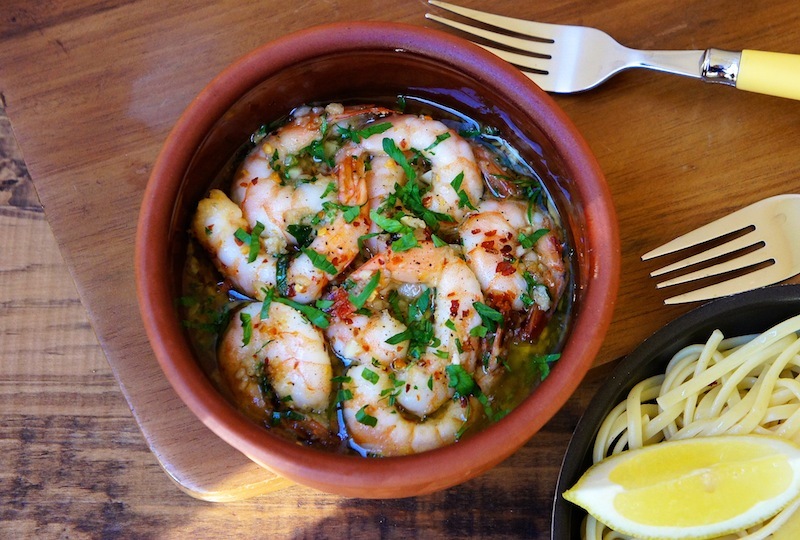 When I go to a new blogger's site, one of the first things I look at is shrimp cooking technique. I'll be keeping my eye on you for a while. I've always wondered what makes shrimp scampi so awesome, and it seems you've added in breadcrumbs! Definitely a great combination here I'd like to try out. Looks very clean and fresh, well done.